Custom Presentation, Pocket, Document and Company Folders. 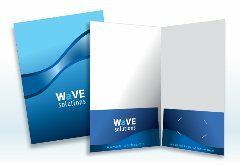 Need a Free Custom Folder Printing Quote for your Company Presentation Folders? Call us at (702) 589-6429 to discuss Custom Folder Printing prices and options. See our Presentation and Pocket Folder Styles. Custom Printed, Full-Color, Premium Presentation Folders, Pocket Folders, and Mini Folders. Company or business presentation folders not only present your product, sales or marketing materials, they also reinforce your name recognition and build brand identity. Premium quality, custom printed, branded company presentation folders and pocket folders are crucial in creating or breaking your company's image. What better way to brand your company than with Full Color Custom Pocket Folders and Presentation Folder Printing! Same Day and Next Day Rush Printing Services for Presentation Folders. LOGO EXECUTIVES offers SAME DAY and NEXT DAY Presentation and Pocket Folder Printing Services in Las Vegas for those last minute company or business presentations, meetings or conventions. Through our Las Vegas digital printing solutions, we have you covered for fast, hi-quality, custom or standard pocket folders and presentation folder printing. Be confident to choose quality printing and design services from LOGO EXECUTIVES when ordering your company's Custom Presentation Folders. The largest selection of presentation folders that includes letter size, 1 and 2 pocket presentation folders, legal size presentation folders, reinforced edge presentation folders, small presentation folders, box pocket presentation folders, expansion / capacity presentation folders, 3 three panel presentation folders, and presentation and pocket folders with foiling and embossing to make sure you present your business in the most effective manner.